The origin of the British Longhair (a.k.a. Lowlander) resembles the British Shorthair. 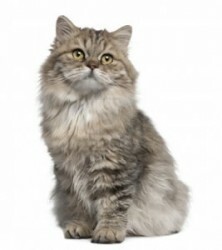 When regular persian cats were crossed with British shorthaired cats, sometimes a kitten was born that has a long coat. It would be sad to catalog these beautiful cats as regular housecats, therefor many breeders are working to get the British Longhair recognized as a full breed. The British Longhair’s type of construction is identical to the British, with the exception of the long coat. British Longhair cats are medium sized cats. They include a wide chest and a short muscular back. The legs are short and straight with round solid feet. A thick tail and short to medium length. The head is round with full cheeks and a wide skull and is located on a short and thick muscular neck. Their Small ears are short and broad at the base and stand far apart. The eyes are round and large, they can have different colors depending on coat color. Their wide nose is straight and should not be too flat, but must have a slight bulge in the forehead. The chin is well developed and firm. Adult males have a more massive head than females. British long-haired cats are, like British shorthair, cats known for their smooth and pleasant temper, they might even be more affectionate than the British Shorthair, but that may of course differ per cat. Most cats are very tolerant and friendly, they have great adaptability. The kittens are as playful as other cats, but then become less active. It is not in their nature to be loud to get attention. They can amuse themselves reasonably. Sometimes they spend hours lying somewhere to sleep, but they also love to be cuddled and petted, and a lot of contact with their house mates they can certainly appreciate. Despite their soft character, they keep their own character and if they do not agree to something they will surely show it. The British Longhair needs good coat care. Normally, a weekly brushing with a bristle brush is sufficient to keep the coat in good condition. In the moulting period, it is best to increase the brushing frequency. You can clean the external ear canal with a ear cleaner for cats dipped in the ear and then rub the surface softly.